International Indian Film Academy award function kick started in Toronto yesterday. A look at the some of the events happening at the function. Double Dhamaal was premiered yesterday with stars walking the green carpet. Mallika Sherawat who stars in the film was seen at the premiere waving at her fan. The actress who is known for her dare to bare attitude left Mumbai clad in burka to avoid fans and shutterbugs. Looking chic and elegant in a beige gown Kangana Ranaut, who also features in Double Dhamaal, walks on the green carpet. Cancer survivor Lisa Ray was all smiles as she came dressed in a black gown oozing charm at the premiere. Actor and producer Anil Kapoor was interviewed on the green carpet at the premiere of Double Dhamaal. Riteish Deshmukh who also stars in Double Dhamaal greets excited fans as he arrives at the premiere. Aashish Chaudhary who will be dressed as a woman in Double Dhamaal was also seen chatting with his friends and meeting his fans. Arshad Warsi who is an old timer in the Dhamaal series is all smiles for the camera. Boman Irani who will host the IIFA awards along with Riteish on Sunday came clad in a grey suit and a hat.He patiently shook hands with his eager fans. 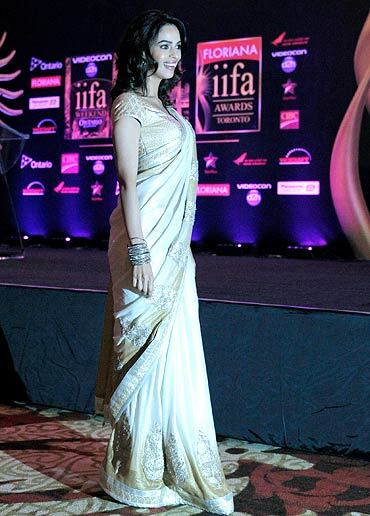 Mallika Sherawat showcases her sartorial style in a saree, as she poses for the media before a IIFA press conference. 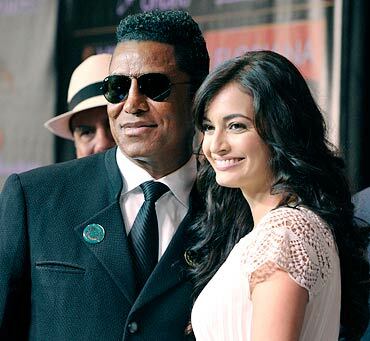 Few actors like Sonakshi Sinha arrived a day later than the others in Toronto on June 23 for the IIFA. Malaika Arora Khan arrives with her son Arhaan and husband Arbaaz Khan in Toronto. Aashish Chaudhary and actress Genelia D'Souza flaunt their designer glares in front of their hotel in Toronto. Hema Malini and daughter Esha Deol arrive at Toronto. Esha Deol will be seen in Tell Me Oh Khuda directed and produced by her mom. 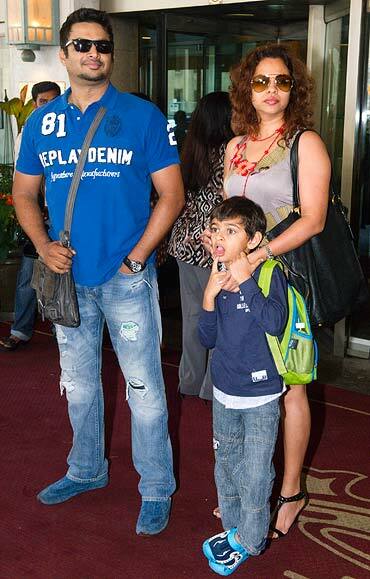 R Madhavan arrived at Toronto with his wife Sarita and their son Vedant.